As a Hollow, he retains the standard, almost expected, Hollow personality. He acts quite evil, messing with people heads when they encounter him, and just likes to cause wanton destruction. He likes to taunt his enemies, either going for cheap shots such as appearance, or even personal information he may have obtained. He is most happy, excited, and jubilant when his enemy or even anyone is on the ground crying or going insane, or even just annoyed by him and his taunts. Akanade enjoys seeing peoples' blood go flying as they are injured. If one could make an endless stream of blood from someone, he would sit there and watch until the end of time, just because he would love to watch. He also enjoys inflicting fatal wounds on people, going so far as to mainly aim for major arteries when fighting. He also dislikes those that are hard to cut, as he believes EVERYONE should bleed, though this odd since he himself is quite hard to cut or damage because of his own unique powers. Not only does he like killing, but he also enjoys random destruction and chaos. Every now and then, he might just attack a small village to destroy entire houses just for the pure pleasure of it all. So, when in battle, if he can blow up or destroy any nearby buildings or damage the battle area, then he will, and more likely than not with extreme prejudice. 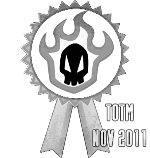 Even through all of his wanting of chaos, bloodshed, and destruction, he retains a shred of honor from his human life. He doesnt tend to go for cheap attacks or fights in groups, as he thinks a 1 on 1 is the best kind of fight, though if he can fight 1 vs multiple opponents, he probably will. If he knows his opponent is already damaged from a previous battle, he probably wouldnt attack them, or wait until they can be healed. Ever since advancing to the Adjuchas level of the Hollow cycle, Akanade has been able to calm down. While he was an extremely angry and ferocious creature when he was a Lesser Familiar Hollow (mainly due to the innate personality traits existing in that Hollow level), now hes more calm, less ferocious, but perhaps just as evil and dark-minded when you really get down to the core of his personality. After turning into a Vasto Lorde level Hollow, he has become much calmer outside of battle than he used to be. He also has complete control of his emotions, and while he can go crazy if pushed to it and resemble his old self, he has, overall, obtained a much higher level of control over himself. Ever since he first became a Hollow, or maybe slightly afterwards, Akanade Hoja has possessed an extreme hunger for power. He is willing to stop at nothing in order to become more powerful, wanting to see unprecedented levels of strength. If he had his way, he would be the most powerful Beijing to ever exist. Though, even if he was, he should still seek methods to increase his power to even higher magnitudes. This is only exponentially increased as a Vasto Lorde Hollow, as he is constantly thirsting for more Hollows to consume, which may be seen as unnatural as most Vasto Lorde Hollows tend to curb their thunder when they reach the final classification of Menos. If you're a Hollow that possesses a high level of strength, be careful to never run into this particular being. He might just eat you. Akanade has quite a few defining features. one of which is the fact that most areas on his body look like they are blades, such as his long and sharp "fingers", though they cannot really be called that. it would be more fitting to say he has 5 swords on each of his hands. He only has 3 on his feet though. 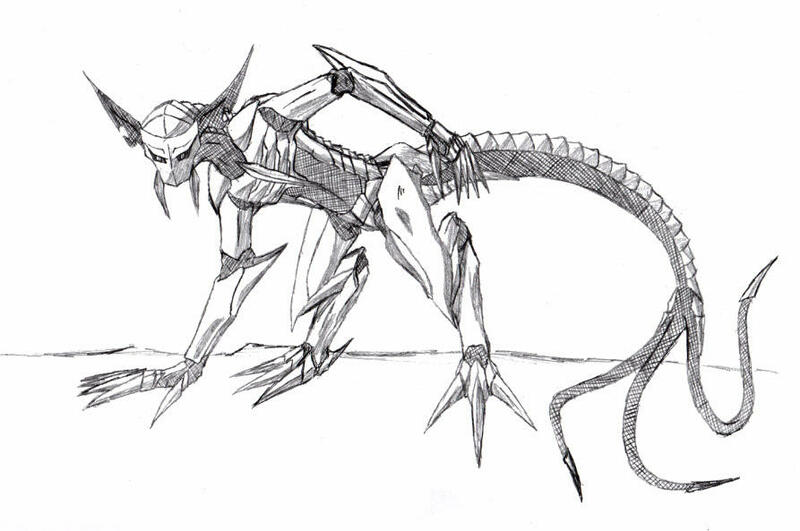 Extending from his spine, he has a long tail that is plated on the top by sharp scale-like pieces of "armor". at about 8 feet down the tail, it splits into 3 separate tails, each 3 feet long, and with tips as sharp as actual swords. His main body and limbs are quite thin, though they are just as long as you would expect from a Hollow, and he is even considered small by Hollow standards, reaching heights of only 9 feet when standing up straight (which he rarely does anyway). Along his spine, there are more plates (like the ones on his tail) that extend all the way to his head, and stops at his forehead. His stomach and abdomen area is rather plain, and is just black body surface. However, his chest is plated by multiple layers of the same metal-like substance that covers most of the rest of his body, though in reality it is part of his body as well. There is a center plate that appears to be his sternum, as it goes down the center of the rib-like plates on his chest. His legs have the same type of joints as many animals, as he has a knee, and a second joint that makes his leg bend again. His feet are rather large, and he has 3 toe-like blades that extend off the front of the feet, as well as a similar, albeit shorter, tose blade on the rear of his feet. His toes are about a foot long. His arms are covered by the same type of "armor" that covers the rest of his body. At his shoulders, his arms are covered by this "armor" and said armor plating extends to his elbow, where it cuts off. You can see black skin, the same type of skin you can see on his stomach area. At his elbow, the plating starts again, though a blade of it extends from the back of his elbow, able to be used as a weapon to fight and block. The plating goes down to his animalistic hands. He has 5 finger-blades on each hand, just like a human, though his are long and sharp, just like that of his toes on his hind feet. They are plated in a way so he can still bend his fingers and such. His head has 2 large black ears that extend off of either side of his skull. Each ear is quite sharp, as though they are blades as well. He has two odd extensions from the sides of his chin, which go down a half foot or so. They appear to be like a mustache, though they are also like large black teeth as well. His mask is rather plain when compared to the rest of his body or other Hollows' masks. It bends to a point in the middle, and when seen from above, the top looks like a crescent moon. The eye holes in the front reveal eyes that are completely black, except for his bright orange pupils that stand out from his white and black body. Akanade possesses supernatural strength, as he is a Hollow, and quite a powerful one at that. He can fling humans against walls like they are pieces of scrunched up paper. His strength is high enough to even lift a dumpster and just toss it at people and send it flying for 30 meters. He can even punch straight through brick walls as well, which is a testament to his pure physical strength. Though, considering the fact that he IS just a lesser Hollow, not even a Menos, he isnt overly powerful. Due to his lithe body, and relatively light weight for his size, he can move at above decent speeds. He can run as fast as a car, and can attack as fast as well, able to catch some opponents off guard with his speed. He can climb the side of a 10 story building quite quickly as well, being able to scale it in just a matter of a few seconds. Again, because he is just a lesser familiar Hollow, he does not possess extreme speed (in comparison to much stronger characters). As he has consumed quite a few other Hollows (numbering in the hundreds), he possesses a very high level of Spiritual Power, and as such is strong in his own right. New Shinigami have basically no chance of defeating him, and even Gotei 13 members have trouble fighting him (though, high-ranked seated members are quite strong). Just by being near humans, they can feel like they are being constricted on all sides just from his Spiritual Pressure. Even though he is a Hollow, Akanade is quite intelligent, able to deduce when the perfect time to attack humans would be. He is able to adapt to battles and events with ease, and can think up plans on the go. He has been able to outsmart any and all enemies he has faced in his past, or will face int he future. he was even smart enough to lure a Shinigami and Hollows to a specific area by killing a bunch of humans and turning them into spirits. The 3 tails that extend from his main tail can extend according to Akanades will, albeit to a point. He can make them extend up to 10 meters, and can use them as ways to capture humans, Shinigami, and even fellow Hollows should he decide to consume them. He can also shorten them as well, being able to bring them back to their normal length quite quickly. The blades on his tail do not extend though, and are always about 13 inches long, though they are quite sharp, and can even be used as "swords". Many parts of his body are covered in as-sharp-as-swords blades that he can use to fight with. Such areas are his tail tips, his fingers, and even his toes. He can also use his elbow blades and knee blades quite effectively as well. His ears and chin extensions are as sharp as swords as well, and can be used to fight with or block attacks too. When fighting him, its like fighting 10+ wakizashis at once, each one an extension of his own body. Almost all of his body (not including his stomach area and the bottom of his tail) is covered in thick, strong-as-steel plating and acts almost like a "Hierro" for him, as they can be used to stop attacks and act as a shield as well. They are quite durable, being able to withstand a direct slash from enemies. Though, they are basically just like steel plate armor, and nothing special like reitsu-infused skin or armor. This is Akanade's appearance as an Adjuchas-level Hollow. In this form, Akanade appears to be a large wolf with even larger bat wings, giving him a fierce look. The highest point on his head is roughly 6 feet and 2 inches of the ground. The fur on his body is a moderate black (appears to be slightly gray-ish), and is moderately long and gives him a shaggy look. Some of her fur is also on his bat wings as well. He has blank red eyes that appear to gaze right through his opponents, giving him an intimidating look. His body is thin with no fat, and well-muscled, which helps him in the speed department and makes him pretty agile as well. extending from his shoulder areas, Akanade has very large bat-like wings that have a large wingspan of about 14 feet when completely extended. The inside of the wings are red with some small black spots, while the outside of the wings are black (matching his body's fur, which is also on his wings), and he also has long, sharp claws extending from the tips of both wings. All in all, he looks pretty badass. Akanade possesses supernatural strength, as he is a Hollow, and quite a powerful one at that. He can fling humans against walls like they are pieces of scrunched up paper. His strength is high enough to even lift a dumpster and just toss it at people and send it flying for 30 meters. He can even punch straight through brick walls as well, which is a testament to his pure physical strength. When he was fighting Eriko, a Captain-level Shinigami, as a Lesser Hollow, he was able to toss cars and run straight through buildings. Now, two Hollow classes later, he is even tougher in the strength department, able to shatter even tough materials. Due to his lithe body, and relatively light weight for his size, he can move at above decent speeds. He can run faster than even speedy cars for an extended length of time (similar to actual wolves), and can attack as fast as well, able to catch some opponents off guard with his speed. He can climb the side of a 10 story building quite quickly as well, being able to scale it in just a matter of a few seconds. In this advanced Hollow form, his speed and agility are both enhanced greatly compared to his maximum as a Lesser Hollow. As he has consumed quite a few other Hollows (numbering in the thousands), he possesses a very high level of Spiritual Power, and as such is strong in his own right. New Shinigami have basically no chance of defeating him, and even Gotei 13 captains have trouble fighting him, especially with his newer, higher reitsu levels. Just by being near humans, they can feel like they are being constricted on all sides just from his Spiritual Pressure. Basic Shinigami feel as though they are being suffocated by this Hollow when in his presence. Even though he is a Hollow, Akanade is quite intelligent, able to deduce when the perfect time to attack humans would be. He is able to adapt to battles and events with ease, and can think up plans on the go. He has been able to outsmart any and all enemies he has faced in his past, or will face int he future. he was even smart enough to lure a Shinigami and Hollows to a specific area by killing a bunch of humans and turning them into spirits. By this point in time, thanks to Akanade's personality calming down due to becoming an Adjuchas, he is able to show his intelligence more often. While an Adjuchas, Akanade has wings! Maybe he drank a lot of redbull? In any case, these wings help him in a few ways. These wings give him the possibility of flight, as they are easily large enough to support his weight mid-flight. They allow him to move quickly and easily in the air, like a jet plane. Another perk to having these wings is the outside of them are more durable then the rest of his body, meaning, by surrounding himself with them, he can take more damage than he normally could. High-Speed Regeneration (超速再生, Chōsoku Saisei; lit. "Ultra-Fast Regeneration") is the ability that allows a Hollow to heal most injuries very quickly, with the exception of the destruction of the head or vital organs. Akanade prides himself on his speedy and useful regeneration, able to regenerate even hard hit/moderate to heavy damage in just a few seconds. Essentially, Akanade can use some of his raw spiritual energy to fire very powerful energy blast that not only do a considerable amount of damage, but also move rather quickly. Different Hollows can fire their own respective Cero from different parts of their body, while Akanade as an Adjuchas fires a Cero by opening his mouth and releasing energy through there. Once Akanade became an Adjuchas level Menos, he developed this interesting ability. Excluding organic materials (such as human, plants, etc), Akanade can infuse any amount of any form of energy he has access to, into random objects he touches. This can be used for both offensive and defensive purposes, and here a few examples of both. Say he shatters a wall, and there are fragments lying on the ground. He could infuse reitsu into one of the fragments, and then send it towards his opponent(s) for increased attack damage. Or, say that wall is still standing and he needs to hide behind it because he is about to get attacked. He could increase its durability by infusing his own energy into it, thus providing him some more protection than normal. This is an offshoot of his Energy Infusion ability. Akanade can charge objects with kinetic energy using his Energy Infusion. The only real limitation to this ability is the time required to charge the object. The larger it is the more time it takes. Most charging takes place through direct skin contact. The Akanade can cause objects to pulsate potent friction. Inert objects will be able to raze through objects. A simple piece of cardboard can become an explosive. Hypothetically capable of increasing or decreasing the speed of a moving object, or alter its trajectory path. If thats too difficult to understand, essentially, Akanade can control the kinetic energy in objects and can increase said kinetic energy to make the object move faster, or even become explosive. The power of his explosions is dependent on the mass of the object he is charging, for example, a charged playing card explodes with the force of a grenade, while something the side of a car would cause a much larger explosion. Similar to all Vasto Lorde level Menos Hollow, Akanade's entire appearance transformed from when he was an Adjuchas. The largest difference between those two states would probably have to be his new overall body shape. Whole he used to appear to be a much larger than normal wolf, he now has a humanoid body shape, as all Vasto Lordes do. He is now six foot ten inches tall, weighs three hundred and fifty pounds, and is every bulky. Despite this, he still appears rather monstrous. He has developed large, slightly bent, extremely sharp horns that grow off of his temples on his skull. Another major feature are his wings, which are vastly larger than they used to be, and are also much tougher as well. His wings are also slightly less bat-like, and more in tune to a dragon-esque side, with the limbs the wings are attached to being much thicker. There also happen to be four of them now. 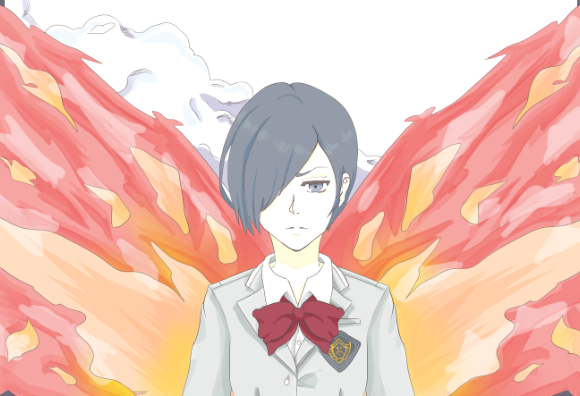 Off of his wings, and his entire body even, a red and black aura radiates, testament to his unbelievable power and his dark personality and mind. Down his back are many thick and durable black objects that almost appear as though they should be a part of his spine, but are clearly not in the correct spots to be. Thanks to his new humanoid appearance, he now has long black hair on his head that nearly reaches to his waist. His hair is rather loose and uncontrolled, though straight. His entire bottom half, starting at the lower end of his torso, is covered in a thick coat of pitch black fur/hair. The coat extends all the way down to his feet, covering them completely, as well as covering his lower arms and hands, appearing to be long gloves. His hands and feet are all very large, and his fingers and toes are tipped with extremely sharp, large, and powerful claws that could tear someone to shreds, and even cut straight through steel. His feet are similar to a wolf's, though they are also raptor-like with the back toe and claw. His skin itself is a bit strange too, being completely white. Not white like a Caucasian human, white like chalk or paper. He also has many extremely small black spots on his skin. Akanade's body is covered in slash-like markings, the ones on his top half being black with a red outline, and the ones one his bottom half being inverted versions of them. 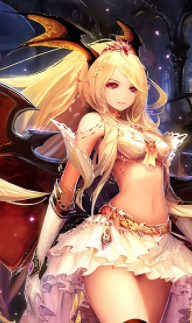 The Hollow's face is rather plain, an average, yet pointed, nose, red eyes with a black outline, and no mouth. Thanks to being a Vasto Lorde, his face appears to be similar to a Vizard's Hollow Mask instead of an actual person's face, making him appear rather frightening to all of those who are unfortunate enough to lay their eyes on him. While not exactly the most astute of scholars, Akanade has developed an increased level of intelligence by evolving into a Vasto Lorde Menos. While he can communicate intellectually, the majority of his intelligence is based in and used for combat. He is a natural warrior, and uses his common sense and mental power in order to strive in battle and defeat opponents. Perhaps when he finally removed his mask, he'll be a bit smarter and sharper? Physically, Akanadeis very powerful indeed. Even while he was just a simple Lesser Familiar Hollow he was able to crush metal and tear straight through buildings. Now, however, he can do so much more. This Hollow has enough power to lift many standard system tons worth of materials, being able to toss around cars and even trucks like nothing. As a Hollow, Akanade possesses an unchecked and immense level of physical strength, rather easily being able to overpower even captain-class opponents. While he may not possess a Hierro quite yet, Akanade Hoja can rely on his body's natural bulk and physical durability in order to sponge blows. Before tiring, Akanade can take quite a bit of punishment, being able to block even very sharp blades with his thick hide, as well as potentially taking high-powereed hits and brushing them off. However,he is easier to cut than an Arrancar of an equivalent strength with a Hierro due to opponents not having to match or beat the Hierro's power, though this certainly doesn't mean he is a glass cannon. There are a few reasons why this particular Hollow possesses such an overwhelming level of pure speed and maneuverability. One major reason is his Menos Hollow level: Vasto Lordes are highly powerful beings, and as such Akanade is one as well. Two, even as a Lesser Familiar and Qdjuchas class Memos he possessed a rather high level of speed. When he fought Eriko Katsuragi, a captain-level Shinigami, Akanade was able to keep up and even push his opponent into turning and fighting due to not being able to outrun him. Also, Akanade happens to specialize in his speed, taking pride in it and constantly striving to hit a new level, which means he is getting faster and faster as time goes on. Out of all his natural, general skills, speed is most certainly what he does best in, being able to keep up with even the faster individuals in the world. The most frightening part about Akanade would most likely have to be his sheer amount of spiritual energy and the spiritual pressure with which he can create. His body is chock full of energy, to a completely ridiculous point. Because he is still a Hollow, his body can just barely contain the amount of power within it, which means he is very nearly bursting at the seems. While he is a Vasto Lorde, Hollows said to possess and even surpass the reitsu levels of even captains, Akanade seems to have more than a Hollow should normally have. Hollows tend to remove their masks long before the point Akanade has reached, making him one of, or the, strongest natural Hollow in existence. Akanade is also an energy-based combatant, specializing in long range battle and Cero instead of a more physical, close range style, which means he has to possess obscene amounts of energy in order to do battle for extended periods of time. Overall, Akanade Hoja can bring captain levels to their knees' incapacitate weaker opponents, and be on par with some of the strongest fighters in existence. Thanks to this, he has decided to be very careful about removing his mask because he would cause a massive amount of damage to the area near him, as well as potentially harm his own body. Another point that must be made regarding his spiritual energy, is because he is a Hollow and only possesses his base form, he is essentially always at max power. This means while he may fight opponents with sealed Zanpakutō's, he is, essentially, radiating Bankai-level reitsu, making him very dangerous indeed. Aside from high speed regeneration, Akanade's second most powerful racial ability is his use of Cero's and Bala's. Thanks to his overwhelming spiritual energy levels, Akanade's Cero is extremely powerful, able to cause massive amounts of wanton damage without even going full power. Akanade also possesses some skill with his Cero and Bala, being able to use them in more creative ways than average Hollows and Arrancar, while also being able to make them more powerful than average. His Cero and Bala also move rather quickly' much faster than an average user's might. 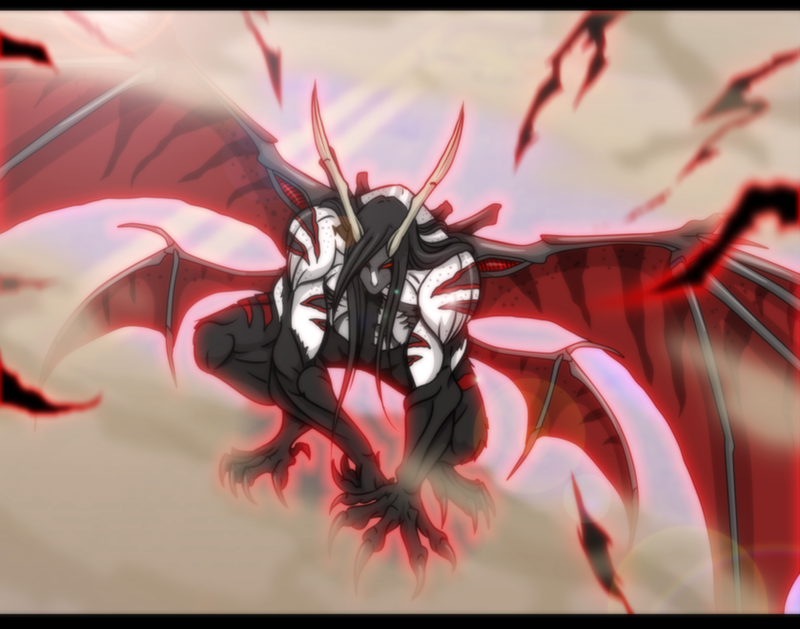 His Cero and Bala are a deep crimson in color with a jet black outline, making them appear rather sinister and dangerous. Even while he was just an Adjuchas level Hollow, Akanade possessed a very high level of physical regeneration, that which equaled and even sometimes surpassed an Arrancar's. Thanks to his recent power ups and his Hollow evolution, which turned him into a Vasto Lorde level Menos, Akanade's regeneration is stronger than it has ever been. His regeneration is strong enough to recover from even potentially fatal attacks, as well as being able to regrow limbs near instantly. Out of all of his Arrancar attributes, his Regeneration is easily the skill he is strongest and most evolved in. He can recover from minuscule and minute injuries essentially instantly. Akanade has developed an additional form of regeneration called Molecular Replication, which allows him to replicate his own molecules extremely quickly, which not only speeds up the regenerative process, but also makes regenerating larger wounds easier. Though his regeneration is powerful, he does not possess a Hierro because he is but a Hollow, and thus must rely solely on his natural durability for defense. Once Akanade became an Adjuchas level Menos, he developed this interesting ability, however it has become much more powerful thanks to his advancement to the Vasto Lorde state. Excluding organic materials (such as human, plants, etc), Akanade can infuse any amount of any form of energy he has access to, into random objects he touches. This can be used for both offensive and defensive purposes, and here a few examples of both. Say he shatters a wall, and there are fragments lying on the ground. He could infuse reitsu into one of the fragments, and then send it towards his opponent(s) for increased attack damage. Or, say that wall is still standing and he needs to hide behind it because he is about to get attacked. He could increase its durability by infusing his own energy into it, thus providing him some more protection than normal. This is an offshoot of his Energy Infusion ability. Akanade can charge objects with kinetic energy using his Energy Infusion. The only real limitation to this ability is the time required to charge the object. The larger it is the more time it takes. Most charging takes place through direct skin contact, though objects within thirty meters of him can be charged as well. The Akanade can cause objects to pulsate potent friction. Inert objects will be able to raze through objects. A simple piece of cardboard can become an explosive. Hypothetically capable of increasing or decreasing the speed of a moving object, or alter its trajectory path. If thats too difficult to understand, essentially, Akanade can control the kinetic energy in objects and can increase said kinetic energy to make the object move faster, or even become explosive. The power of his explosions is dependent on the mass of the object he is charging, for example, a charged playing card explodes with the force of a grenade, while something the side of a car would cause a much larger explosion. Akanade can also increase his own kinetic energy, which could potentially increase his overall speed exponentially. Also, he can increase the kinetic energy in his own attacks, which gives him the ability to make a Cero move much quicker than normal. Can also be used to superheat objects, lighting them on fire and melt ice that cannot normally be melted. This ability is essentially the exact opposite of Akanade's Molecular Acceleration ability. Instead of charging objects with kinetic energy, Akanade disperses and removes the kinetic energy within objects. With this ability, Akanade can slow down bullets to the point of being able to flick them away. He can also slow himself down if he has built up too much momentum when moving. Combined with Molecular Acceleration, Akanade has high completed control over his own body's movements. Being able to slow down physical objects, Akanade can slow down an opponent should they get too close to him, essentially making them appear to slow down in time, though in reality it is just their molecules moving slower. This means should a lunch be coming towards him, he can slow it down enough so it doesn't do as much damage as it normally might, or even perhaps dodge it. It also means he can reduce friction, heat, and even put out fires using this ability. Akanade cannot completely disperse someone's kinetic energy, as he can only decelerate them, not completely stop them. Thanks to his control over molecules and atoms, Akanade has figured out how to essentially teleport himself to other places. By dispersing his own molecules, the molecules that make up his body, Akanade can send himself over distances without a true physical form, which also makes him "invisible": he has no physical body when he uses this ability. While he can do this to himself, he cannot do it to other people or objects due to ability limitations and the fact that he is still a Hollow, and thus does not retain control over the most advanced forms of his abilities. Due to the difficulty and potential power of this technique, he can only send himself to another location within two hundred and fifty meters of his original point up to a maximum of two times per post. Akanade as a human was known as "Segima Hiwatara", though he just went by Seg when being spoken to by a friend, and even told teachers to call him that. He was born in Karakura to a middle-class family of 4 others, a mother, a father, a sister, and a brother. His brother, Ichinaka Hiwatari, was 2 years older than him, and his sister, Sakura Hiwatara, was 3 and a half years older than him when he was born, making him the youngest of 3 siblings. His mother, Inata Hiwatara, was 37 years old when he was born, and his father, Goragon Hiwatara, 39 years old. As a baby, and even into his toddler years, he was relatively average, being loud, crying a lot, and whining when he didnt get his way. This annoyed his siblings quite a bit, though more so his brother as his sister had already dealt with it from her other brother. When he turned 5, he was enrolled into an elementary school nearby his house. he got along with others fine, and was quite happy during this stage of his life, being carefree with no worries in the world, and just enjoying life in general. When he was in third grade (now 8 years old), his mother became sick from lung cancer, for she had been a life-long smoker. After hearing this troubling news, Akanade began to become much quieter as a child, deciding to read books instead of play with friends like an average child of his age. His father spiraled into depression as his mothers condition got worse, not really talking to Akanade or his other children. This affected everyone in his family, his children growing cold to others. Though, they all cared deeply for each other on the inside, no matter how they acted. By the time his mothers funeral rolled around, the entire family was deeply depressed, barely talking to each other during the days leading up to the funeral, usually sticking to one-liner conversations or simple "Hello"s and "Goodbye"s. Akanade was still keeping up in school though, despite the fact that he often daydreamed. When he was 14, his family was going to an old relatives house. though, on the way there, his father crashed their car, and every member of the family was injured in some way, with Akanades father being the worst off. They went to the hospital and feared for their fathers life, though they all recovered and were good as new in just a few weeks. After such a disaster, they began to open up to each other, and even began to speak to each other and grow close again. By the time his sister had moved out, and it was just their father and Akanades brother living together, his father began to date again, much to the dismay and anger of his children. Eventually, his father ended up getting married again to another woman, an American named Susie Browschower. This angered booth of his children, though eventually Ichinaka began to warm up to her, leaving Akanade as the only one that felt as though his mother was being replaced. He began to slower grow more and more cold towards her, eventually ignoring her completely. Akanade was 18 by the time he died on that fateful fay that would forever change him. On his way to his graduation from highschool, he became distracted by a small box his "mother" had given him earlier that day as a present for graduating from highschool. Opening it up at a red light, he saw it was covered in paper. Right as he was about to open it, a large truck crashed into the side of his car, killing him almost immediately. This destroyed his remaining family, causing grief to plague their minds. After dying and becoming a human spirit, he chased down Susie, as his clouded mind believed it was her fault that he had died that day. After a few years, he eventually found her, and through a series of unfortunate events, he ended up killing her and his father (the latter was on accident though). Shortly afterwards, he discovered the present she had given him. Turns out, it was a ring that his real mother had been given by her mother, and so on so forth. After realizing that Susie DID care for him, he went through an insanity process, that eventually turned him into a Hollow, because it corroded his chain of fate extremely quickly after that point. After becoming a Hollow, he hunted down both his brother and sister, and ended up killing both of them out of "love", but really it was just a part of his Hollow process. He began consuming other humans at a high rate, already having consumed close to 200 people by the time he ate his first Hollow brethren. He craved more power, and as such, ended up consuming a few more hundred Hollows, and even a few Shinigami, before reaching the point of his life he is at now. Akanade stumbled upon a Shinigami named Eriko Katsuragi, and viciously attacked him. Their fight led them all throughout Karakura, destroying quite a bit in the process. Due to Akanade's overwhelming Hollow strength, he was able to push Eriko to the ropes multiple times, but their fight ended in a draw as it wasn't able to be finished. Akanade has vowed to find this Shinigami and destroy him at all costs. A few months later, Akanade had already run through becoming a Gillian-class Menos, and had consumed many others of the same level. Eventually, he ended up becoming an Adjuchas-level Menos, and has been feeding on other Adjuchas-Hollows in order to further his development even farther. His goal remains the same: find and kill the foolish Shinigami who got away from him. However, he also joined the newly formed organization called Shadowfall and even became the Hollow Monarchs Viceroy, essentially making him the groups leader. He has been getting stronger and forming a Hollow army ever since. One day, Akanade received news regarding a rather wild battle involving an Arrancar, a Shinigami, and a human. The Arrancar had been beaten to a pulp, as had the human, and the only one left standing had been the Shinigami, Redd Tseuken. However, Akanade would not stand to let his Arrancar brother be defeated so easily, and potentially killed, so he immediately entered the battle, coming onto the field through a Garganta from Hueco Mundo. He challenged and attacked Redd the Shinigami. 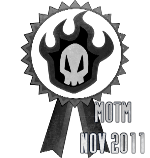 Despite his best efforts, the Shinigsmik simply could not defeat, or even damage, the Adjuchas Hollow who stood before him. Meanwhile, Akanade had forced the shinigami to release his Zanpakutō and had delivered some good hits, thanks to his skill with his Cero, and was pushing his opponent back. However, seeing the Arrancar could still try to escape, and also noticing his opponent was a weakling, Akanade left the battle and returned to his base of operations in Hueco Mundo where's he belonged. Not long after the fight with the Shinigami Redd Tseuken, Akanade began feasting upon his fellow Hollows again. He relished in their destruction, consuming their power and abilities in order to make himself stronger. Realizing his growth phase begun to slow down, he hunted down, defeated and killed, and consumed only the strongest of Hollows in Hueco Mundo, Earth, and even the Demon world. After consuming a particularly powerful batch of Adjuchas class Menos, Akanade began his transformation into something much more than his previous forms.....he had ascended to Vasto Lorde form. This would be the epitome of his strength as a Hollow, giving him access to never before seen levels of power. With his new power, Akanade once again took control of Shadowfall's Hollow Monarch, returning to his seat of power as Viceroy. He now awaits the day when he will remove his Hollow Mask once and for all. It was a sunny day in Karakura town, unlike any other during this specific summer. Though, this day wasnt a normal day compared to the others. No, this was a day that would be etched into the minds of humans involved for the rest of their lives. Akanade the Hollow had been waiting for the perfect moment to strike, and today was the day he would get an especially tasty treat. On a large highway where hundreds, even thousands of people, traveled upon every day, an odd aura was resonating from a short distance away. this, of course, was Akanade himself. He was sitting there, scanning the surroundings for any unwelcome visitors the stage of his plot. During the time of the day when most people would be traveling on the highway, Akanade put his plan into motion. Akanade began by jumping onto the center of the highway, landing on top of a small sports car, crushing it, and everyone inside of it. As cars drove by, he whipped his tail at them, destroying cars and many humans as well. He was causing more and more destruction, at this point having killed over 30 people. As the amount of souls in the area grew, more and more other spiritual entities began to gather and watch the madness, ie other Hollows. Finally, the black-robed grim reaper has reached the stage., he thought to himself. He was right though, a Shinigami assigned area had finally arrived wondering why so many spirits were gathered into one area. The sight he met upon his eyes was not pretty: A Hollow had killed tons of humans, as well as devoured quite a few other Hollows as well. "Hollow! What is this madness?! Have a deathwish? I'll avenge all of those innocent humans you slaughtered!" Comments/Notes: You love your hollows. This has been put into Archives! Feel free to ask a staff member to move it back! Taking these out of Archived and back into Approved!